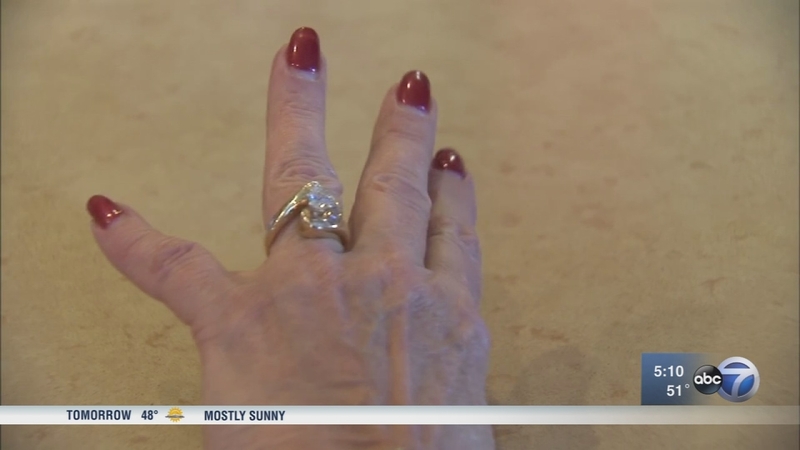 CRYSTAL LAKE, Ill. -- A lost wedding ring is back on the finger of a very grateful woman, who used a neighborhood app and word of mouth to get it back. Phyllis Helton and her daughter prayed for the return of the ring after she thought her most prized piece of jewelry would be gone forever. "We were just praying so hard, and so many people praying. I said God's going to get that ring back to me," Helton said. The trouble began for the 66-year-old wife and mother the Tuesday before Thanksgiving as she headed to the grocery store. That's when she lost the 3-carat pear-shaped diamond wedding ring her husband Albert designed for her when they got married 19 years ago. Helton said she took it off in her car and put it on her lap for just a minute to apply some lotion. "I went back there and looked and looked," she said. Helton frantically called her daughter about her missing wedding ring but didn't tell her husband about what happened until after the holiday. "I had a lot of anxiety. It was hard to see," her daughter Bonnie Kassel said. Helton had returned to the parking lot of the Whole Foods in Kildeer several times hoping to find the ring. But on Saturday, when she headed back to put up flyers, she got some help from an unlikely source: a customer shopping in one of the strip mall's stores used the neighborhood app Nextdoor to help her. "She said here, this woman found a unique ring," Helton said. That stranger showed Helton the post and connected her with the person who found the valuable keepsake. "Mia said, 'I'm going to find the owner of this ring,'" she said. Soon she was on the phone with the Good Samaritan who, after verifying that the diamond was indeed hers, returned it. Thursday afternoon Helton, who now only takes the ring off at home, said the act of kindness that brought her ring back to her is the best gift she ever could have received. ABC13 has partnered with Nextdoor to bring you more stories that matter to you to your neighborhood.